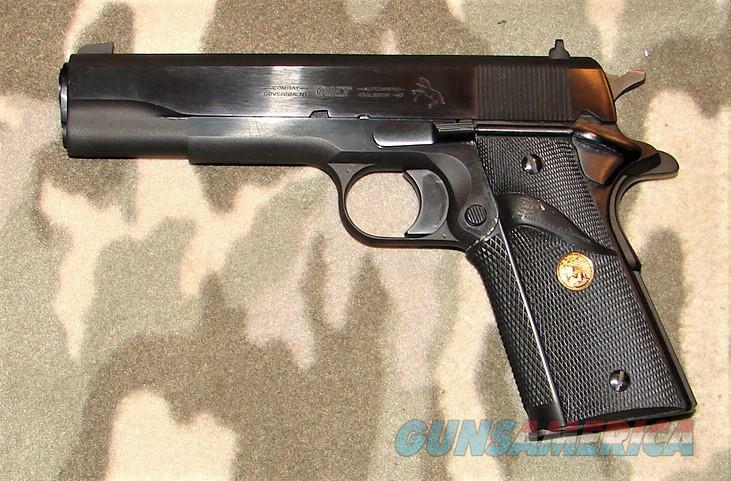 Description: Colt Combat Government Model Semi-Auto Pistol serial #70B55497, 45 ACP, 5" barrel with an excellent bore. This series 70 pistol retains about 99% factory black finish. The factory checkered rubber wrap around Pachmayr grips with gold Colt medallions rate excellent. This pistol features a long trigger, flat mainspring housing, high visibility white outline drift adjustable rear sight and Patridge front sight. This pistol was the predecessor to the Combat Elite and includes a factory woodgrain and Styrofoam box that is correctly end labeled and numbered to the gun, a single magazine, hang tag, manual and paperwork. The pistol appears as new in the box, unfired.